Established in 2000, NTS Europe manages and markets a small but select portfolio of innovative products sourced from France, Spain, the UK, Australia and the USA. NTS Europe is the primary distributor of a range of innovative and award-winning products in both France and the UK, aimed specifically at the end consumer. We are well positioned to determine product feasibility based on the different uptake rates of different countries and market sectors. NTS Europe's range of safety products are all unique in their own way. But far from making them "no brainer" sales opportunities, their unique characteristics mean that end user acceptance can take quite some considerable time to obtain. Establishing a particular brand in the market is rarely achieved in isolation, so NTS Europe is constantly on the look-out for innovative products that will complement its current range and which will support its market development efforts. traXion Solutions was established almost 10 years ago with a small range of highly effective surface treatments to make slippery surfaces non-slip. Now traXion's range of slip-proof solutions include LiquiGuard's range of slip prevention treatments. instant fabric, vinyl and PVC repair tape that works on just about anything - NTS Europe is the main distributor for this amazing stretchy, permanent patch in France. so just how do you carry skis and poles safely and securely without having the skis bash the backs of your or other people's legs or head, without them swinging around wildly, without them tripping up others or acting like mini-snowploughs, and without wearing out or putting holes in your expensive ski clothing? Here's how. throw out your unsavoury, mould-infested and unsafe bath and shower mats and decals and replace them with one of our award-winning bath and shower treatments that will make your slippery bath or shower non-slip in a matter of minutes. protective coatings that are eco-friendly, non-toxic and provide excellent wear and durability for consumer, industrial and commercial applications. Something exciting, possibly even somewhat alarming, that will be for sure. We receive product propositions all the time, but as you will see from this presentation of a sample of our portfolio, what we are most interested in are products that are quite simply innovative and will benefit the end consumer, the general public or the work place. Our health and safety products are primarily intended for professionals working in a very diverse range of sectors, from the safe egress of buildings to improving working conditions (and hence productivity) to securing the structural integrity of metal frameworks. not just a guidance system, but the only emergency lighting system on the market that is guaranteed to work in the event of an emergency as it uses photoluminescence to enable you to literally « see in the dark ». in addition to its domestic range of products, traXion also offers a range of professional solutions to reduce and prevent slip-related accidents in the workplace, in public spaces and in commercial premises. a new range of mastic guns designed to reach the parts other guns cannot reach while ensuring the operator remains well within the health and safety at work guidelines. eco-friendly and non-toxic speciality coatings to protect people and surfaces in the office, on the factory floor or out in the elements. 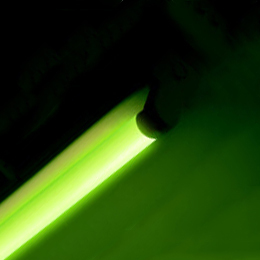 Lumenite is a simple opaque plastic sleeve that is loaded with photoluminescent molecules. Slide it over a neon tube then place the tube back in its fitting, switch the neon tube back on and within 10 minutes you have transformed your standard light fitting into a maintenance-free emergency light fitting that will not lose its ability to provide emergency lighting for more than 10 years.